work perfectly with the White Mailing Labels from Avery! Talk about instant labels! 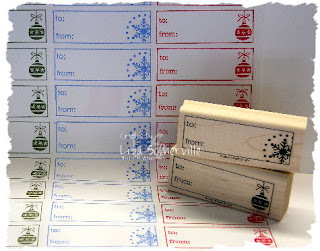 Just stamp, address, peel and stick! I love those tags!!! Oh my gosh, I have that set and am thrilled I won't be running out of tags this year for the billions of gifts I have to buy my kids! Thanks for the fabulous idea!